Synopsis: Studies show that happy people are the most innovative, and more productive. The Happiness Quotient is therefore integral to a successful corporate strategy. In Innovate Happily, bestselling innovation guru Rekha Shetty's new book, Junie, a bright young executive, meets Rags, a wise, hi-tech coach. Together they discover the secrets that create progressive and happy communities during a visit to Bhutan, the modern-day Shangri-La, a land that actually measures its Gross National Happiness. 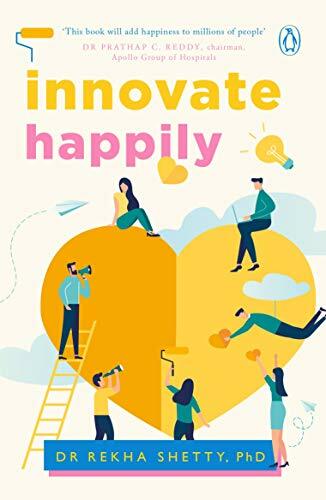 Through a series of analytical and self-actualization exercises, Innovate Happily shows you how to innovatively increase your Happiness Quotient and take it to your own town and organization. About the Author&colon; Rekha Shetty, Ph.D, founder of the Mindspower brand, is the managing director of Farstar Distribution Network Ltd, a twenty-year-old consulting company working exclusively on innovation initiatives. She consults for some of the region's foremost blue chip companies. Keenly involved in social action, she is one of the first women Rotary International governors in Asia and a recipient of the Service above Self Award. Apart from the bestselling Innovate! and The Happiness Quotient, her other books include The Way to a Healthy Heart: The Zero Heart Attack Path and Corporate Strategy: Mindspower Innovation.